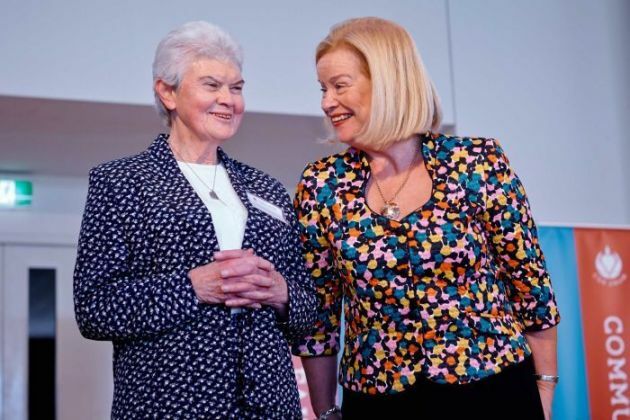 (Photo: Kincoppal Rose-Bay School)Sister Philomene Tiernan (left) with Kincoppal-Rose Bay Principal Hilary Johnston-Croke. Hundreds of hundred mourners crowded St. Mary Magdalene Catholic Church in east Sydney on Saturday to pay tribute to Sister Philomene Tiernan, one of the victims of the recent MH17 plane tragedy. Tiernan, a staff member at Kincoppal-Rose Bay School, was returning to Sydney, Australia from a spiritual retreat in France. But suspected pro-Russian separatists in Ukraine are accused of shooting down the plane, killing all 298 passengers, including 36 Australians. The missile also stopped the home return of the 77-year-old nun. Monsignor Tony Doherty said at the service, "She was a woman of astonishing grace, great charm, and above all, a gentleness. I must say I found whenever being with Phil that I came away feeling a more expanded person." Bishop Peter Comensoli, who led the Mass at Sydney's St Mary's Cathedral on Sunday to honor the victims, said, "The downing of MH17 was not an innocent accident, it was the outcome of a trail of human evil." He said there was a "blame and buck-passing" strategy of those believed to be responsible. "Evil will try to hide, obfuscate, deny. But by the light of day the true picture will be seen." The Vatican press office released a statement Sunday saying, "Pope Francis has learned with dismay of the tragedy of the Malaysian Airlines aircraft downed in east Ukraine, a region marked by high tensions. "He raises prayers for the numerous victims of the incident and for their relatives, and renews his heartfelt appeal to all parties in the conflict to seek peace and solutions through dialogue, in order to avoid further loss of innocent human lives." While in Paris, Sister Philomene reportedly saw Saint Madeleine Sophie Barat in her resting place at St. Francis Xavier Church, a very special moment for the nun. School principal Hilary Johnston-Croke said, "We are devastated by the loss of such a wonderfully kind, wise and compassionate woman, who was greatly loved by us all. tragic loss of both Phil and the other passengers on the flight." Sister Philomene served the school for 30 years, and was a Board Member of Kincoppal. Former student, Lucy Thackeray said Tiernan had an impact on thousands of girls at her school. Tiernan was described as a loving "Nanna" with the ability to make the students feel special. A Daily Mail Australia reporter, Thackray expressed difficulties in writing about her favorite mentor. "This is undoubtedly the hardest thing I've ever had to write, and I think that's because I just don't feel my words can do justice to what an amazing woman she really was." Australians are in deep anguish as stories of victims and mourning families emerge. Prime Minister Tony Abbott said that there would hardly be any Australian who had not been emotionally disturbed by the tragedy.